Last night, Dorianne and I got together with Richard Clark and Mary Stec to participate in the New York Times Wine School. 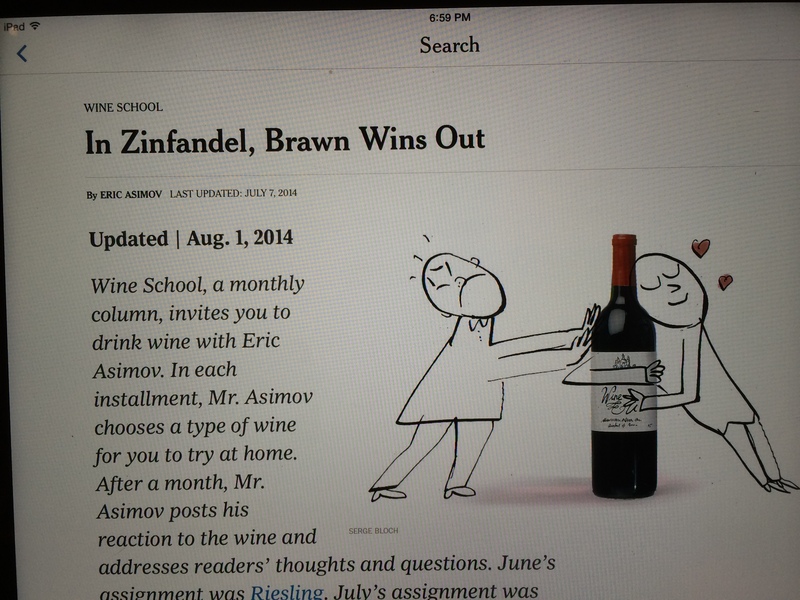 The Wine School is a monthly look at different varietals written by Eric Asimov, the Times wine writer. The purpose is to take a deeper look at various varietals and to actually drink the wine, rather than just taste it. Richard, as I have mentioned in other posts, is the winemaker for the Conejo Valley Wine Co-op that Dorianne and I belong to. We have done the previous Wine School varietals, usually two at a time, with Richard and Mary. We decided to do the Zinfandel, from July, on its own. Appetizers were gathered (baguette, prosciutto, goat and cheddar cheeses, smoked fish, and marinated peppers), and the main course – an AMAZING chicken mole with black beans and rice, was prepared by Mary (she and Richard used to import mole from Oaxaca in Mexico, so she knows her stuff). Anyway, this is really about the wine. The Wine School always recommends three choices for the varietal of the month – wines that are likely easier to find in New York than in California in most instances. For the Zinfandel Wine School, Asimov recommended three wines: a Dashe Dry Creek Valley Zinfandel 2012 $21, Turley California Zinfandel Juvenile 2012 $30 and Ridge Dry Creek Valley Lytton Springs 2011 $35. Well, we didn’t have any of those, so we used two wines and had a back-up standing by. 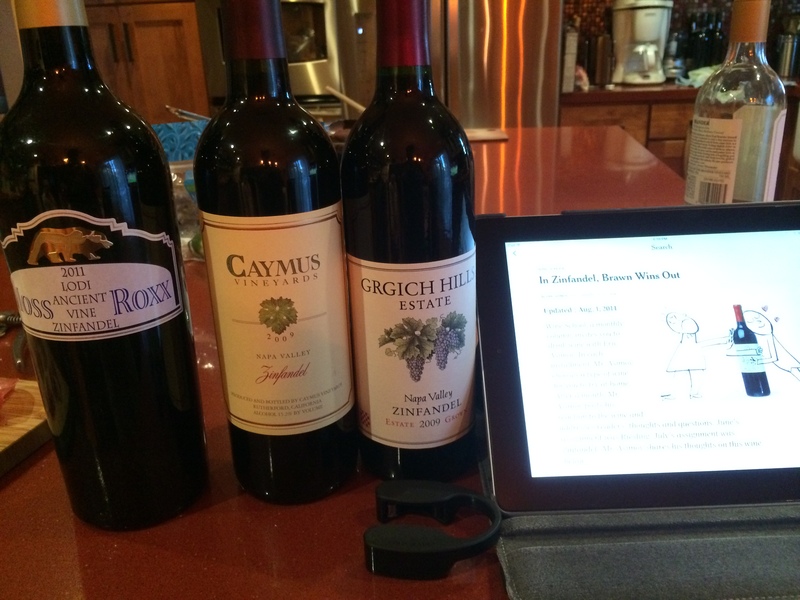 Our Three Wine Choices – the NYTimes Wine School on the iPad. Our wines were a 2009 Grgich Hills $34, a 2009 Caymus $45, and a 2011 Moss-Roxx Ancient Vines $20, the latter remaining unopened. Zinfandel has been in California since the early 1800’s and originally came from Croatia, where it is called tribidrag. I understand that it is also the same grape as primitivo in Italy, although there is some controversy about that. Zinfandel, like all varietals, can show up in a variety of ways, influenced by everything that wine is influenced by – climate, weather, soils, sun and temperature, viticulture, wine making practices, ageing, etc. However, in general, the wine falls somewhere between Cabernet Sauvignon and Pinot Noir on the heavy to light red wine continuum. I find that Zin and Syrah can be very similar in tone and texture. It is normally great with meats and grilled foods. There are also some very interesting non-traditional Zinfandel blends showing up in places like Paso Robles. 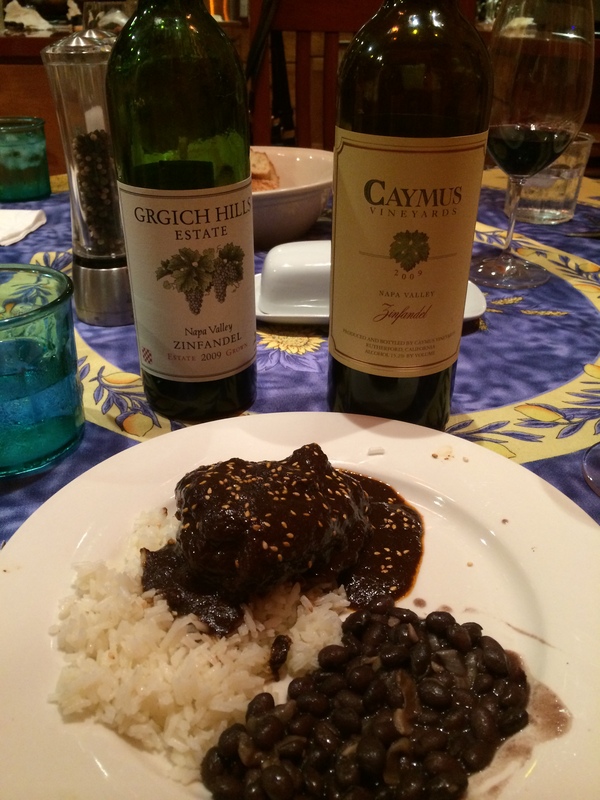 The Grgich Hills and the Caymus were very different wines. The alcohol content was equivalent – 15.3% and 15.2% respectively, but the style was very different. The Grgich Hills was soft and elegant and the Caymus was big, bold, and heavy – definitely a Robert Parker kind of wine. Fortunately, we opened the Grgich Hills first to have with the appetizers. It was a perfect complement to the prosciutto and cheeses and the other items. Elegantly balanced, the wine had spice notes, pepper, and fruit present. Delicious. The Caymus was something else. Heavier, almost syrupy on the tongue, it was a fruit bomb. Fortunately, that was what the chicken mole required – something to stand up to the richness of the sauce and the greasy chicken. Richard preferred the Caymus to the Grgich Hills, I took the opposite position – although both are very good wines. The wines and the Chicken Mole made by Mary Stec. The alcohol level of these wines made opening the Moss-Roxx unadvisable. It is resting back on the shelf as I write, waiting for another day. Zinfandel has its lovers and its detractors. I am generally a fan, although I don’t actually drink that much of it. Our co-op made a pretty good Zin in 2010 and our just-bottled 2012 vintage includes a Zin-Merlot blend that should be interesting. Let me know what your favorite Zinfandels are and what your best food pairing experiences have been in the comments section. Interesting Zin choices Jim–not the usual “go to” Zins from a land rich in Zin choices. I am very curious how the Moss-Roxx stacks up against the two you had–my sense is it would do very well.